People make certain systematic errors in their judgments. We’d like to think this is only true of others, but it’s true of us as well. Even brilliant people who are experts in their fields make certain types of predictable mistakes. Michael Lewis’s book The Undoing Project traces the lives and work of Daniel Kahneman and Amos Tversky whose joint work “created the field of behavioral economics.” This book gives an interesting account of the two men’s lives and a gives fascinating insight into their results. With most examples of the types of judgment mistakes people tend to make, I had to admit that I’m susceptible to the same mistakes. I’d like to think that understanding these tendencies will help me avoid some future mistakes, but I’m not sure it will help as much as I hope. The current “powerful trend to mistrust human intuition and defer to algorithms” is sensible. Most of the time, the automatic judgments our brains make work very well for us. But when they don’t work well, it’s hard to stop making mistakes. It’s easier to understand this problem when it’s our eyes that make the mistake. 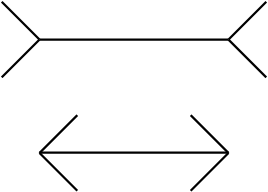 Consider the Müller-Lyer optical illusion. “Linda is a bank teller. 85% of subjects chose the second option, even though logic dictates that it can’t be more likely than the first option because the second is a subset of the first. Even when they changed the question to make it clear that the first option doesn’t mean that Linda is “NOT active in the feminist movement,” subjects still favoured the second option. Graduate students with training in logic and statistics made this mistake. Even doctors made this type of mistake. Kahneman and Tversky faced a lot of opposition from economists. One economist’s paper opened with “The agent of economic theory is rational, selfish, and his tastes do not change.” That may make it easier to build theory, but it doesn’t sound much like actual people. But economists clung to this view that people were rational even in the face of mounting evidence from Kahneman and Tversky. In this battle over whether people are rational, Kahneman and Tversky even reached back to a paper written in 1738 by Daniel Bernoulli (English translation here). Bernoulli offered a model of financial decision-making that we now call utility theory. He believed that people should treat a doubling of one’s net worth as just as good as halving it is bad, even though the dollar amounts won and lost are different. Tversky wrote that “Bernoulli sought to account a bit better than simple calculations of expected value for how people actually behaved.” I’ve read the translation and I see no evidence this is true. My reading of Bernoulli’s paper was that he sought to model rational choices, not the irrational choices people actually make. I went into more detail on this subject a few years ago. Just because fire insurance on a house has a negative expectation, it isn’t a “stupid bet.” I don’t know if this misunderstanding is just Lewis’ or if it is Kahneman and Tversky’s as well. It is irrational to accept a 50/50 bet to either double your net worth plus a dollar or lose everything, even though it has a positive expectation of 50 cents. Bernoulli’s theory isn’t a perfect model of rational decision-making, but it is far better than simple expectation. All that said, Kahneman and Tversky’s prospect theory is an excellent model of how people actually make decisions, which is clearly different from a purely rational method. Overall, I found this book up to Lewis’ usual high standard. It gives very accessible insight into Kahneman and Tversky’s work and gives interesting accounts of their lives and collaboration. Anyone who enjoys this book should consider reading Kahneman’s Thinking Fast and Slow. Love Tversky's comeback to the statatician. Sounds like he was quite the character. Thanks for the review...I have the book on order. @Garth: Unlike many bloggers who seem to use book reviews to promote books, I try to give my readers enough information that they can tell whether they want to read it or not. After you read the book you can tell me if I steered you wrong. Not sure if you covered this before, but I'd love to get your take on the interplay, if any, between Behaviour Economics and the Efficient Market Hypothesis. I tried asking Thaler this when he was in Toronto a while back, but never got the chance. @Fernando: Deep questions. I've never been overly concerned with the Efficient Market Hypothesis. I think markets are mostly efficient, but sometimes they're not. Perhaps behavioural economics has something to say about why markets are not completely efficient, but I don't have any useful insight there. The evidence seems to show that markets have been getting more efficient over time, probably because more and more money is either indexed or managed by professionals. But, whether any of that is correct or not, I don't believe I can beat the market, and I don't think I can find a money manager who can beat it for me after subtracting his fees. So, EMH has nothing to do with my own choice to index. For me, lower fees means more money in my pocket. I do think that behavioural economics affects passive index investing. It likely explains why so many people don't index. It may also explain why so many bail out of stocks at the worst times. ...and belated greetings. Yes, The Undoing Project by Michael Lewis is is a fine read. I also agree that Thing Fast and Slow is a worthwhile read, especially since Kahneman has some well-grounded evidence against individual stock picking. As you're a baseball fan, I can't resist asking if you've read Michael Lewis's Moneyball, and what you thought of it.